When you think of spring, what prints do you think of? Florals? Stripes? Those are the top two but, we all seem to forget about the other major print – gingham. Gingham is actually a type of plain-woven fabric that is a checkered plaid print. I like to think of it as the spring version of all the flannel tops that we wear in autumn. The pretty, preppy fabric is taking over fashion right now and stores are selling a variety of different pieces in the gingham print. Another major trend this spring is pastel colors so what designers did is combine the two trends to have pastel-gingham clothing. While the traditional black and white combo will forever be a classic to wear – adding in some bright yellows, pinks, and blue into your wardrobe will instantly make you more cheerful. Whether that comes in the form of a button-down top, off the shoulder dress, boyfriend blazer, or a full body jumpsuit – there’s a place for gingham in your closet. There are so many different options for wearing the picnic-friendly print. My favorite, however, has to be the simple button down top in a light baby blue color. Pair that with cropped white jeans and some sandals and you’re wearing the unofficial uniform of spring. 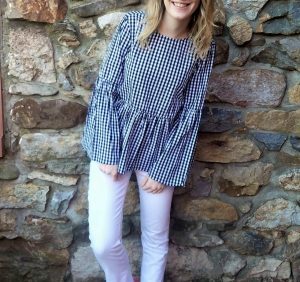 My look pictured above is also combining gingham with another major trend – bell sleeves! I loved wearing this top, it was flowy and fun and it felt more like spring when I was wearing it. A really cute trend for spring is wearing a crop top and wide leg pants that are the same spring. This, in turn, has made crop tops stylist again! Pair your top to bottom gingham look with a circular woven handbag and some sunglasses and you are ready to hit the beach for spring break! My absolute favorite gingham piece in my closet is this boyfriend blazer from Nordstrom. 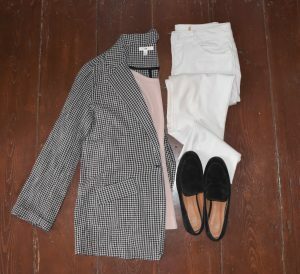 I don’t own many blazers, nor do I have a place to wear them (casual work dress code) but I love wearing this blazer with a cute blush top or graphic t-shirt underneath. A style that people have been slow to adopt over the past couple of years is patterned pants. We have all become so custom to solid color jeans, that we have forgotten about how fun printed pants can be! I for one am certainly guilty of only wanting to wear jeans all the time and it took me awhile to come around. My opinion changed instantly when I tried on a pair of cropped gingham pants. These pants in the classic black and white checkered print instantly made me feel stylish and trendy. The beauty of the pants is that you can pair them with any number of different solid color tops too! Another cute trend that will be big for summer is gingham print shorts and skirts that will pair well with off the shoulder tops and sandals. A major trend that has come to light this season is jumpsuits. While they have always been there – jumpsuits and rompers are selling big time in stores right now. What I see a lot of is gingham print jumpsuits and dresses are selling like crazy. You wouldn’t think that someone could possibly look good in head to toe checkered print, but think again. It’s actually a really chic look that will make people take a double take of your outfit. Simply pair with some ankle strap heels for the ultimate spring look. Next time you are out shopping looking for something cute to wear to your next spring party or barbeque, steer away from the florals and stripes. Focus on the fun checkered print that is taking over spring fashion. Whether it comes in the form of an off the shoulder top, bell sleeve blouse, crop top, romper, high waist shorts, or a cute summer dress – there’s a place for gingham in your closet. If you are interested in learning more about spring trends I have teamed up with one of my favorite fashion bloggers to bring you more spring trends that you can add to your wardrobe. Zoe is the girl behind the Zoe Vogue blog and she writes about personal style, fashion trends, and how to build up your wardrobe. That’s a really cute shirt! 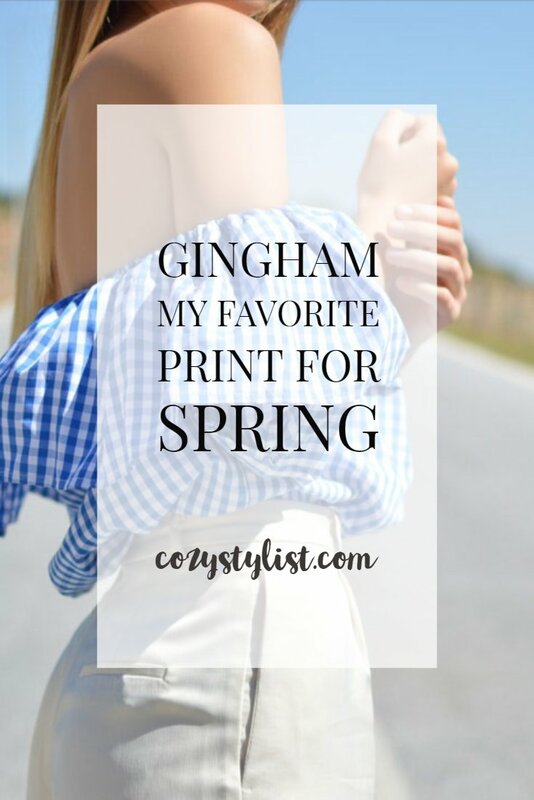 I love Gingham – super cute especially for spring! Really suits you as well! haha, I love all of those things! I practically live in bell sleeves and jumpsuits, and this spring gingham and patterned pants are my go-to items! I’ve been loving the gingham trend lately and seeing so many tops in the shops selling in this style makes me scream for pay day!